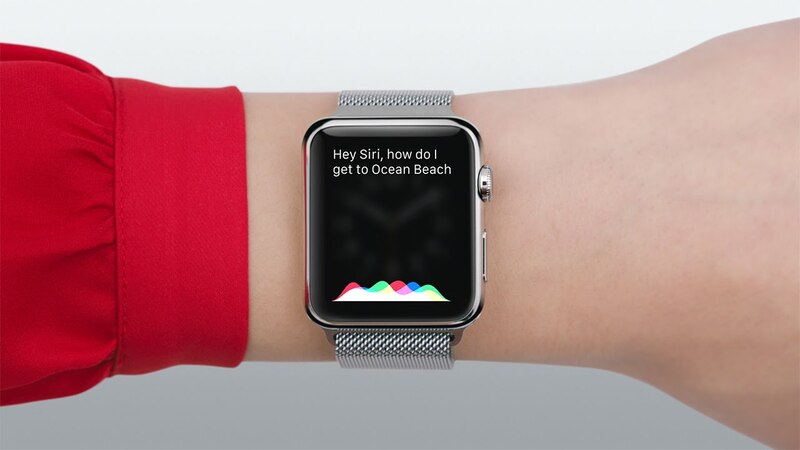 Hey Siri, what’s the future of user interfaces? About a month ago, the Apple Watch finally launched in Sweden – nearly three months after the US launch. Although the watch itself hasn’t really excited me, I was still very eager to try out this new kind of device. It represents a new product category that I have been interested in exploring. What would a device like this mean to my everyday life? Would I actually use it? Would I enjoy it? Apple has proudly labeled it as “their most personal device yet” and I was eager to see how true that was. So far, my friends reactions have been entertaining. They have gotten more excited about this than the usual gadget. “What can it do? What do you use it for? Can I see it?” are questions that are immediately asked. Now, this is not a full featured review of the Apple Watch. I recommend you go to TheOatMeal, The Verge, and Medium.com for indepth look at the all the pros and cons of it. I will briefly touch upon some of the things that I was worried about before I got it and what has surprised me since. I should say that besides being excited about new technology in general, my reason for getting the Apple Watch was to see if it would curb my phone usage. While it does sound a bit ironic that I would use one device to use another less – it has actually reduced the time I spend using my iPhone. My iPhone is my connection to my personal and business world. I use it, especially in the evenings, to keep track of all email that is coming in. Before the watch, the use case was that I’ll pull out my phone to check my email, but look at Facebook, scroll through Instagram, and then flip through Twitter. Instead of checking my email (1 minute), I’ll spend a good 30-45 minutes browsing all my social media channels. The Watch allows me to see any important email coming in, but would be too small to pull me into the social media loop. This has probably been the most rewarding benefit of the Watch so far. Stocks – I use a the custom Modular face to see my most recently viewed Stocks. This way I could easily keep track of Twitters recent fall as well as Amazon’s gains. Workouts – I used a Jawbone UP previously and was always keen on getting my daily goals. I managed 10.000 steps daily for 30 days in a row! With the Apple Watch, it’s divided into three parts; Calories, Exercise and Stand Ups. Getting 30 minute of daily exercise can be tougher than it sounds. I’m still not entirely sure how it’s calculated as a 35 minute fast run resulted in 21 minutes of exercise. I’m nagged to stand up once every hour and I have no idea what this actually does to my health. But when the Watch tells me to stand up, I stand up. Notifications – Getting notifications from other apps can be a time saver. It allows me to view a notification even if I may not be able act on it from the watch. I have the opportunity to see if it’s something I need to act on now or if it’s something that can wait (like @channel or @everyone mentions in Slack-channels, comment update to Facebook threads I’m following, etc.). Text messages and dictation works better than anticipated – 90% of all my iMessaging is with my wife and I’ve found that 5 different pre-written replies really take me a long way in our communication. I’m not entirely sure that is a good thing, but it works pretty well. Also dictation to messaging works far better than anticipated (this works on your iPhone as well but doesn’t really makes as much sense). Battery life is longer than expected – Much of the criticism ahead of launch was the Watch’s battery life. I’ve found no problems at all and I usually have 40-45% battery remaining at the end of the day. Charging is so fast that I’ll just put it on it’s charger for an hour in the morning instead of during night. As the technology changes, the way it can be integrated is going to change as well. What is the next evolution for products like Siri? The next Apple TV would only benefit from a Siri integration. Think about it, early voice controlled systems were limited because they were … dumb. Saying ‘Switch to channel 5’ is more complicated than just pressing ‘5’ on your remote. A single action is always easier to perform when it has a dedicated button, but performing a series of actions using an intelligent backbone will changes things. Instead of going into TV Shows > Purchased > Suits > Season 4 > Latest episode > Play, I would be able to say ‘Hey Siri, play the latest (unplayed) episode of Suits’. Siri would understand the actions needed to bring up the episode, know what seasons/episode is next. and simplify the entire watching experience. ‘Hey Siri, show me the news’ would show me the latest news based on my news settings in News.app. It would pull together all relevant news clips from different networks as well as online sources like the Verge. Interactions have previously been solely action triggers; pressing X performs X. As our access to data and content continues to grow, user interfaces will need to be more complex to allow users to easily perform custom actions; action + content + time. As each of the parameters will be dynamic, buttons can no longer be static. Clearly UX and UI designers will face new challenges when designing interfaces in the future as the market grows into more devices like the Apple Watch. UX designers will have a wider range of actions that need to accounted for and UI designers will need to design user interfaces that are more dynamic and customizable.